Follow @mcphoo Tweet The hypothesis was that a bottoms up 16kg would correlate with a 20kg press; the next hypothesis was that by working easy versions of one arm push ups and headstand push ups, i could get a 16kg BU and a 20kg press - without pressing kettlbells for the 40 days of the easy strength program. That's a lot of hope and spit. In part 1 i gave the reasons for this set of hypotheses; in part II i talked about dialing in the right level of "easy" and showed how progress was measured on the road. Where we left off, i'd just successfully, actually hit target one: a bottoms up with the 16. The next test of course would be the 20.
another go. It worked. Again. My goodness! what a day.I then tried the twenty. It didn’t go all the way, and it ended up feeling more like a side press, but that was a HUGE jump in progress. More than that - yes - is possibly *feeling* this notion of groove that Dan John was talking about - at least i thought i might be. It seemed that to get the 16kg BU i had to change the shape of where the press happened and if felt like more of the back of the shoulder was getting into the act from this new position. What i describe may be obvious to everyone else alive but it has not been to me. The next day, Saturday Nov 5, 33 days in, i retried the 20. It was back to glued on the shoulder; recovered; bottoms upped the 16. Recovered, and retried the 20 with that groove in my body. oh wow - it got off the shoulder, and then it started to move. At glacier speed. It probably looked like it was stopped or stuck but i KNEW - i just KNEW it was still moving and still going up. What IS that??? it felt like i just KNEW those fibbers were going to recruit and get that sucker up. I must confess i was pretty happy. I expressed a bit of a whoop. BUT i feel like my hypothesis of correlation has at least provisionally been found credible: there is a correlation between the 16k bu and the 20k press. It’s taken to get that BU with a sufficiently heavy weight to really feel what the movement is to manage the whole press with that grip. BUT, by getting the groove difference with the heavy weight i started to take that back to a lighter weight where i can get more reps grooving in that pattern. That i think is important. I couldn’t FEEL that shift along the back of the shoulder with a lighter bell; i can’t rep it with a heavier. Now i can apply the heavy bell feel with the lighter rep-able load. At least that is the plan. What does this new groove feel like? well, at a sticky point actually past breaking parallel, where it feels hard, moving back a bit recruits it seems a bit more from the back into the shoulder and that extra fiber helps put that puppy up. At least for me. 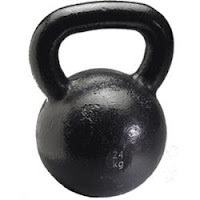 In playing with the 12 which is my light weight in Return of the Kettlebell, i've experimented now with arm position - how in front of the shoulder the press is vs how"open" or more barbelly it is - just to feel what has a wee bit more effort or less. It's subtle but getting it right a weight that feels easy, can feel easier/smoother yet by playing with that position. What is that right level of easy effort for easy strength to work? as i can’t do a 1 full rep headstand push up or a one arm push up. And pistols well, on good days there are reps; on other days i hold a door and on excellent days a KB. So i just went by feel. How far from the wall for two good reps - today - easy to adjust the bod for each rep to nail that. The one arm push up i pushed a little harder. Perfect form on the plank but initially didn’t go nose to the carpet. So less range of motion. I kept thinking hard enough to require an adaptation; not so hard i can’t do this every day. Not so hard it becomes a mental challenge to get through. Implementation of Easy Strength: Different but Same? My easy strength series has been a little different from what i undrestand to be the norm. I had a goal to get my BU 16k, and from that, the 20. My understanding of easy strength is that one practices the same moves one wants to improve: to push a deadlift, for instance, do the easy strength deadlifts. Or use a thick bar for the deadlift - same but different. I didn’t do that. I couldn’t as i didn't have those tools available. But i did use the tools i had. Me. I am a great tool, apparently (one of the infinite tools). It seems (though i cannot absolutely claim correlation, what else the heck is there going on), 33 days of easy strength BUT not touching a kettle bell, just doing bodyweight work in Easy Strength ways (a) got me a Bottoms Up PR and (b) got me my 20 back. Only a single, but that’s all it takes, isn’t it, to rekindle faith that yes, my shoulder IS recovering. Bodyweight to improve kb’s. That’s different but same (as opposed to same but different). Really? seems maybe so. That 24 - the main prize - maybe just got a little closer? And i still have 7 days left. Update: perhaps no surprise after a month on the road and hitting a PR, an absolutely fever level cold hit me full throttle on Monday Nov - with fever, even - and according to my sense of self, and my heart rate variability, i’m in no shape to train. Indeed today (friday: 11/11/11) was the first day back to doing my easy strength in yet another hotel room. So i can either declare success at 33 days in or keep going with it for a week to get in the full 40 while i figure out next steps. My sense? Even if i bag this round of easy strength now and step into some more regular workouts or another variant of easy strength, that’s fine too. Dan says his best gains have come around the 21 day mark and that’s a fine place to change up and over. For me, it’s been 33. Cool. And on top of this plateau breaking, i’m also gaining some new skills. Like this bodyweight work - that’s a definite keeper for my practice. doing some handstands and one arm pushups aren’t getting in the way of anything else. 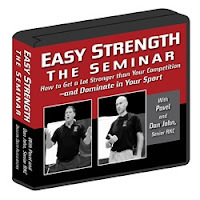 And i need the reps.
At the easy strength workshop (and i’ll have to check through the 14 DVD’s if this made the cut) - i think i asked Dan or someone did about why ever go off easy strength to do something else after 40 days if this works so well? I do believe he turned aside and stage whispered - you don’t have to - with the high implication that you won’t believe me telling you that so we’re going to talk about other approaches that work too. I think, though, for me, where i'm at in my practice, i have to learn to love the nudge at the bottom end. It's something i can repeat daily and find progress around. I recall that in getting her beast challenge, Asha Wagner repped and repped with only the 16 and the 12. Dan John also saw the sense in this for several of the iron maiden moves. I personally sense the sanity and hope of that path - again - just speaking for myself. And i have my own evidence now that (a) getting the right level of "easy" effort (b) leads to transferable gains. With my focus still on rehabbing towards an iron maiden challenge SOME day, from steady progress, i've just started playing with changing up the pistols to box pistols with the 8's for 2*5's, and will see how that progresses up in load. I know i felt that in my run last night: oh that's where the gastroc origin is. Happy to learn that. For my hinge work i'm doing 2*20s of kb dl's - the rest is staying the same. But while i'm around kb's again i'm also practicing the bottoms up work more deliberately - but keeping it in a grease the groove fashion. c) is with the bodyweight stuff teaching me new skills that i wish i’d had the sauce and insight to work on sooner. d) shows me that showing up and punching the clock - with the right effort - in order to “nudge the bottom” as Dan John and Pavel talk about in Easy Strength highlighting work from a pantheon of progenitor easy strengthens, seems to Work. e) i don’t have to worry about being away from the KB’s to make gains in the moves i want to improve - at least not at the moment perhaps. And the biggest right now - the mental shot - is that i *have* to believe i’m recovering - finally - from the shoulder stuff. Now i admit i likely won’t really believe that till i press the 20 again for reps. And then i won't likely really believe it till i press something heavier than a 20, but it’s getting closer. So stay the course. And on the other hand: that i *can* do any of this is, my shoulder issues have made me realize, a gift. So daily practice like easy strength isn't a burden or just a punch the clock thing. Really, it's a little miracle. So ya, finding a way to move every day? i'm there. 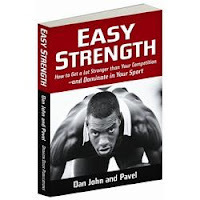 IF you haven’t read Easy Strength yet, it’s good stuff. Especially if strength work is your sport supplement, not your sport. Will be writing more about that in the near term. but for now, 33 is a magic number. Yes it is. 33. I enjoyed that. I ordered the book and enjoyed that too. It's good to hear that progress is there and that injury be damned, you will be stronger than ever. Your post has inspired me to start my own Easy Strength program. I'm on day 4 of the 40 day program. I have recorded my exercise data before starting and will check the same exercises after I finish the 40 day program to see if there was improvement. The big advantage of ES for me will be the ability to exercise and play golf without foregoing either. I'm an older guy who walks the course and carries his own golf bag. That wears me out and therefore interrupts my kettlebell workout schedule. If ES works, I should be able to do both. I'm looking forward to your next post on ES IV. I read your blog about your experience with Easy Strength (ES) and decided to try the program hoping to better integrate both my golf and my strength building. I finished the ES 40 day program and can report, in your words, bummer! No progress. Ending: R = 8, L = 6. Ending: R = 15, L = 14. In the 40 day period I worked out 34 days and had 3 breaks of 2 days each. My goal was to workout 5 of 7 days but I would actually go beyond 5 days without stopping when I felt good. I started the program with the weights too light and was soon able to increase the weight or the reps. I always did 2 sets of each exercise with not more than 5 reps. The Power Swing was in my ES program to follow Dan John's recommendation of having a hinge action as part of the program. I blame my lack of progress on my age, 71, because it's probably true. Or maybe not enough protein. Or maybe the before and after tests were not exactly compatible. Who knows? I was initially very discouraged until I read a recent blog posting by Mark Reifkind. Rif recently quoted Pavel “a back of iron and legs that never quit” as he wrote about his own desire to have a high degree of work capacity and be functionally strong. Since I still play golf and carry my golf bag when I play, perhaps I'm at the level of having a high degree of work capacity. I'd like to think so. Do you have any thoughts on how to make the ES method work for me? probably if you saw my comment about "bummer" you saw what i did next: i increased the load. also remember the protocol is two reps for five sets or some days three for three or five for two but generally 2 for five. so you may want to experiment with going back to two reps per set, and just increase the load so it feels a bit more challenging. give it a go for two weeks and see how that works for you.